The battle may be over, but the war has just begun. Captain America: Civil War is only one week away, and at this time, early reviews have been almost unanimously positive. And of course, with a few new sets of promotional material, comes endless possibilities of easter eggs, appearances and probably a glimpse of what is to come for Marvel's Phase 3. To get ourselves ready for the war of the superheroes, here is a shot-by-shot breakdown of the movie's second trailer, with some descriptions as to what we can see in the image. This is a updated post from our previous post - Spotted! Part 8: Captain America: Civil War. Again, this is Dateline Movies, and may the best team win! 8. "Whose Side Are You On? ": The poster above which, I have to say, is kinda balanced, despite the large number of characters visible. From what we can see, this seems like the official rosters for each faction. On the left, we have #TeamCap, or as in the comics, the Secret Avengers. Falcon and Bucky are obviously with the Captain given their friendship, and Scarlet Witch probably still doesn't trust Iron Man after the events of Age of Ultron. Ant-Man, although unseen, probably because he owed Falcon before. The intriguing part here is why would Hawkeye join Cap? I know they are friends, and seems to be a loose cannon, but something might have happened to Hawkeye that forces him to rebel. Was his family attacked? Or does he know something the rest don't? On the right we have #TeamIronMan, or again from the comics, the Mighty Avengers. Given that they have a history with Iron Man, War Machine and the Vision join his cause, and Black Widow, who might have been worried as well about what would happen if heroes are left unchecked, especially since she was an assassin. Black Panther's motivation here remains a mystery. It is possibly hinted that he teams up with Iron Man, despite being said to be joining as a neutral party, because Bucky's actions might have caused some trouble in his homeland Wakanda. Besides, could he possibly have killed his father? Oh, we almost forgot. Here is the latest trailer for the movie, in case you missed it. 9. "This job, we tried to save as many people as we can, sometimes it doesn't mean everyone, but you don't give up." - Steve Rogers/Captain America - The trailer opens with a view of an undisclosed location, possibly Russia, where the Winter Soldier is forced to become an assassin. So we might expect a flashback regarding good 'ol Cap or Bucky, which might be pivotal as the movie progresses. It might even give us a sneak peak as to what might Baron Zemo is cooking-up in his sinister hideout. Does this mean he has an entire army of Winter Soldiers under his command? Then again, those uniforms seem a little something like what a government agent would wear. And in the scene featuring the highly anticipated chase seems to show that both the Black Panther and War Machine are apprehending Bucky. It might even show that Zemo is in cahoots with the United Nations, hiding his own agenda. We see the United Nations building destroyed by an explosion (which we'll cover later), and in the middle of the destruction, an injured Black Panther, who seems to have been joined-in after Ultron used Vibranium, a mineral usually found only in his homeland, for his creation of the Vision. This might also be the reason why Black Panther decided to accept Iron Man's invitation, thinking that the Winter Soldier caused this. During this part, we get to learn a little of what Iron Man has been up to. After unleashing Ultron's wrath unintentionally, and having to witness people die because of his weapons, Iron Man realizes that there is only one way to find peace in our time, and that is by supporting the act and setting-up an underwater prison? Whoa, that sounds un-Tony like. In the comics though, he actually asked the aid of Baron Zemo to round-up all the bad guys to create an army that could apprehend unregistered superheroes. This team is called the "Thunderbolts Army", based on Zemo's villain team. This scene also confirms Wanda's remark, that she "doesn't know the difference between saving the world and destroying it." Serious tension between the two Avengers here. It's clear here that Captain America doesn't support Iron Man's position in the conflict, because for him, it is overstepping on the liberty of heroes, then Iron Man hits back with an awesome one-liner. Afterwards, we got to see a little more chase, which looks like it takes place after the incident at the United Nations building. Now we get to the part where it seems to look like the build-up to the incident. We see here Bucky, looking aggressive, clashing with Iron Man. But wait, isn't Bucky free of mind-control? What could he be doing here that resulted in him being framed for the explosion? Our theory goes like this. Remember the government catching Bucky part? What if Bucky is captured by Iron Man, and to get the Sokovia Accords in-play, they make him cause an international incident to make it look like he was right the entire time? Again, this sounds nothing like the Iron Man we know, but he actually did this in the comics. Instead of the Winter Soldier however, he used an enemy of his named the Titanium Man. Things get out-of-control however as, judging his expression, they didn't plan on having him actually kill people. Another theory could be that the Winter Soldier is willing to do what is right, and that he hears of Zemo's plans to start an international incident as a distraction, and unfortunately he crosses paths with Iron Man. We'll explain later on the part where in the New Avengers have to infiltrate the other IFID, or the Institute For Infectious Disease (as seen in some shots and the first trailer), as this'll coincide with our second theory. 14. "RHODES!!!!" - Iron Man - Arguably the most shocking and the most thrilling glimpse in the trailer is that of Lt. Col. James Rhodes' possible demise at the hands of the Vision? Okay, okay, you might think it's Bucky, but look closely, as it really looks nothing like a grenade launcher that hits him, but a beam of light similar to the ones the Vision projects. What could this mean for the Vision? Could this mean that Zemo might have gotten control of the Vision and is using him as a weapon? 15. 'I was wrong about you. The whole world was wrong about you." - Iron Man - I'm not exactly sure who said this but judging by the voice, I'd say it was Tony. Based from his tone and choice of words, he seems to be aiming those words of hatred to Captain America, as in he used to believe he was a friend, and the world believed he was more than just a soldier, but he proved him wronged with his actions. This could mean that here we won't see Iron Man and Cap mending fences anytime soon, especially since he might think the Winter Soldier has some connection with how Rhodey "might" die, or the fact that he did kill Tony's parents. Unless this is already the ending, wherein the two heroes resolve their differences, he might be saying sorry to the Winter Soldier, after seeing him stop Zemo's plans. So does this mean he's the next Captain America? This part actually intrigued me. Why would Captain America's team be targeting the Black Widow, if we are to base this on Iron Man's words? What if in the first half of the movie, she was actually a mole inserted by Tony to oversee their activities in order to avoid as much damage as possible? Looking back at Age of Ultron, it is fairly visible she doesn't want to kill, and her motivation could be linked to the fact that she served the KGB and HYDRA unwillingly in the past. In short, she wants to do what she thinks will avoid deaths, sharing her ideals with Tony. But she also believes Iron Man is not also in the right as Black Widow retaliates with 10 simple words. 17. "This doesn't have to end in a fight, Tony." - Captain America - This line obviously is not spoken in this scene, but rather his confrontation with Iron Man in the next shot. Let's focus however to the background. According to some sources, this is said to be the Parker household, where a certain wall-crawler lives. In the comics, Spider-Man initially joined Tony, to which he is rewarded with the Iron Spider Suit. Think of an Iron Man armor with Spider-Legs in the back. He eventually sides with Captain America after learning that Tony has been spying on him. Could this be the scene wherein Cap asks the assistance of the web-head himself? 18. "You just started a war!" - Iron Man - This clearly screams sadness. It can be visibly seen that someone integral to Iron Man's life has suffered because of Steve's arrogance. This could also mean that Tony's guilt is not the only motivator for him, but also for the fact that Bucky did kill Tony's parents. It is confirmed though. You can watch it in Captain America: The Winter Soldier. Also, let's get a load of the background in this scene. We see someone in a septic tank, possibly resembling the Winter Soldier in stasis. However, some sources say that this isn't so, as this is another one of the many Winter Soldiers hidden away long ago. However, it could also mean that Tony is creating a superweapon to combat unregistered heroes in the form of a resurrected Quicksilver. Again in the comics, Iron Man behaved almost like a complete madman, and he did that there by creating a Thor clone that killed an innocent hero. What if he is using this as a way to control the Scarlet Witch, or combat them equally? Okay for those who don't know like me before, this is a callback to Captain America's line in the First Avenger, when he was being bullied for his skinniness. Technically speaking, as what sources say, he just thinks Iron Man is a bully in the neighborhood. But before this exchange, we have seen a ton of awesome shots, including the Vision and Scarlet Witch battle (FYI, they are a couple in the comics, y'know? ), Ant-Man riding on Hawkeye's arrows (which he might do to deactivate Iron Man's armor, the same way he did with the Falcon's.) and Black Panther showing-off his bulletproof suit! And finally, we reach the final scene that has brought joy, warmth and excitement to every heart who have beheld the trailer, and that is the return of the Friendly Neighborhood Spider-Man. I don't understand why people don't seem to like how he's voiced (he is after all suppose to be a teenager here. ), how the CGI is made (it's pre-CGI, the complete version won't be shown until you see the entire movie.) or the fact that he seemed to have ripped-off Deadpool, even if Spidey was the first one to have moving eyes. (No offense mate!) He actually did this in the comics guys. His lenses move in the comics, to show his emotions. Besides, it's not all meta, it's actually digital. If you listen closely, it sounds like they are goggles. Stark-grade perhaps? 21. The Best Laid Plans - Okay that's a wrap for our part 8.5. But wait, what about the part where I explain Zemo's plans? Well, I'm very glad you reminded me that. Well hold-on to your seats as I explain a possibly spoiler-filled theory on how Zemo's plan may unfold. Wait, what's that dad? The post is getting too long and you and I both know how people don't like long posts? Oh well so much for the whole master plan thing. Be sure to stay-tuned for our next post to discover what Zemo is really up to in his twisted mind. Whew! Well that was so tiring and somewhat productive for me at the same time! 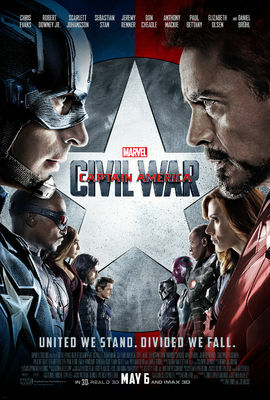 Are you looking forward to Captain America: Civil War? If so, did I spoil a lot for you? Hopefully not! Anyway, have a nice summer dear readers, and enjoy this donut-related pre-Civil War incident between Robert Downey Jr. and Chris Evans, and here're some Lip-Sync Battles featuring Clark Gregg aka. Phil Coulson and Hayley Atwell aka. Peggy Carter.